We ran a poll on Facebook, Twitter and the forum asking what you would like to hear about, and adventuring, character growth and deck building topped the list. Well, you also said you wanted to hear more about the battles, but since we’ve devoted three diaries to that already, this week we’ll discuss characters and decks. We’re working on this right now, which limits what we can say about it. Some stuff we can’t talk about because it isn’t even designed yet! Other things are designed but will almost certainly change as we implement them. Don’t worry though, there is still much we can actually discuss. 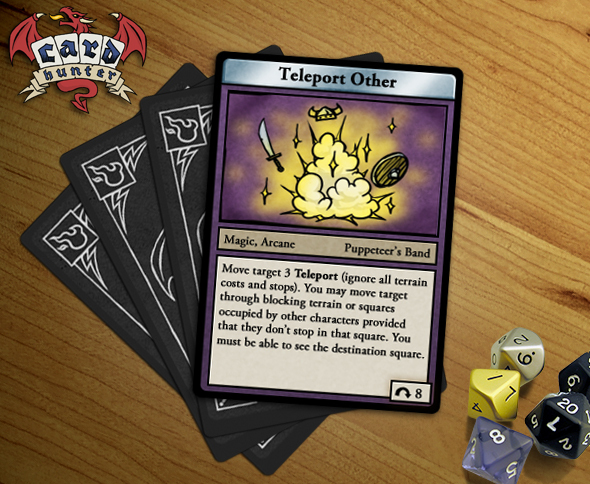 In the very first dev diary I said that a goals of Card Hunter was to “create anew the sort of creative tactical decisions that I had when I first started playing collectible card games”. One way to do that is to take an existing game and tweak the formula, fixing things and changing things up. For example, you could take a game like Magic and say: “What if we added a board and let you move your pieces around?” or “Let’s change the mana system so that you can play any card as a land and never get mana screwed”. If you take these approaches you actually end up with decisions much like what you’ve seen before, maybe slightly better or with a bit of a twist. We wanted more than that. We wanted to create a new set of decisions and problems that would challenge and surprise people, even people who were used to card games, summoning monsters, and mana cards. In Card Hunter each deck is a character, so when you build a character, you build a deck. How do you build a character in an RPG? Mostly you choose that character’s gear, and that’s the same in Card Hunter. To build a deck you choose what weapons, armor or magic items you want your character to use. The trick is – each item or piece of gear you equip adds a bunch of cards to your deck. Is the Puppeteer’s Headband just the same as the Teleport Other card then? No, it isn’t. When you equip the headband your Wizard adds three cards to their deck: Two copies of Teleport Other and another card called Maze of the Mind. You can’t pick and choose which of those cards you want – you get one, you get ’em all. The Puppeteer’s Headband gives your character all three cards, no more and no less. Similarly, a sword carries some attacks and maybe some blocks, a suit of armor gives you protective cards and boots give you cards that pump up your movement. Each type of equipment gives you cards that represent what that item does. So, you build your character by equipping them with items and, as you put those items onto the character’s sheet, their deck grows. Simple, right? It is, but it brings with it a lot of complexity and questions, which we’ll have to save for next time. Are a character and their deck defined by more than the gear they use? – Yes. Do different characters equip different types of items? – Yes. Is the Puppeteer’s Headband a fun way to irk your opponent? – Yes. I hope you enjoyed this quick introduction to deck building and characters. Until next week. I am so insanely excited for this game. So many, many questions to ask, yet won’t, mostly because you just stated you’re still working on the things which I might ask. I just hope that if there’s a deck size limit, it will be one that is large enough to allow for elaborate, or even downright insane, builds. My favorite Magic deck was around 250 cards, mostly because it was 5 color, built on Dual Lands, Arifacts that messed with/moved/retrieved enchantments and Creatures that only provided mana or enchantment alterations. So, needless to say, I like big decks and cannot lie. That’s all kinds of a cool design. I was wondering what the item names meant before, it’s obvious now. Deck building just got more interesting to me! a good twist on the deck building mechanic, because it lets you (the devs) balance powerful cards more easily… BUT i think it takes out too much deck-customization. especially because im guessing that each character has only a limited number of equipment slots and things like having 3 pairs of boots equipped wont be allowed. Should think of it more as character customization rather than deck customization. I guessing that there will be many types of items for your character to wear i.e. the ring of pillaging, the boots of tile slapping, the neck tie of strangling, the chainmail bikini of bouncy destruction, the robes of distraction, the hat of pointy death, the nobbly staff of compensating, the book of almost forgotten spells and your wizard is now well equiped for battle. Then I am guessing there will also be skill cards? Yes, this system does reduce the total number of decks that you can build as compared to a system where you could just put any card you like into the deck. However, we do have ways of making sure that there are still many, many different types of decks you can construct. Next week I’ll write a diary explaining why we think this system is cool and the sort of things we hope to get out of it.